The latest issue of Hungur Magazine--featuring my short story, Infinity Drift--is now available by Sam's Dot Publishing. Infinity Drift is a story about an isolated crew member overseeing a deep space voyage who discovers that something on board is feeding upon the ship's 200,000 hibernating passengers. I'm pleased to report that my short story, Food For Worms, has awarded honorable mention in the L. Ron Hubbard Writer's of the Future contest for Q4, from among the hundreds of stories that were submitted for the contest. While I'm disappointed that my story didn't earn prize money, this only motivates me to get writing again in 2013! Kicking off the holiday season with another publication! Normally, Christmas and horror don't mix. But those genres are crossed creatively in the newly published anthology, You'd Better Watch Out! featuring my short story, Slay Bells. Slay Bells is a story about a terrified boy who goes on the run after waking up to discover coal in his stocking. This collection is available at Amazon.com [click HERE to purchase]. 'Twas the night before Christmas, and all through the house, not a creature was stirring, not even a...shh!...did you hear somthing? Cruentus Libri Press is glad to bring tidings of comfort and joy, in the form of sixteen tales of festive fears and holiday horrors. Whether your taste is for ancient Yuletide traditions, steeped in terror and blood, or stories of undead Santas and killer reindeer, this collection reminds us that there our foul things hidden beneath the merriment at the darkest days of the year. You'd Better Watch Out! 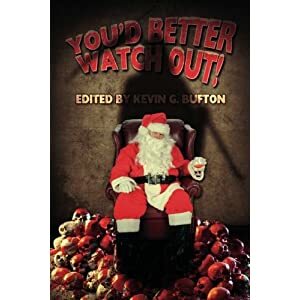 contains stories from some of the world's finest horror writers, including Angela Pritchett, Gregory J. Wolos, David Williamson, Jay Wilburn, Ken L. Jones, Matt Kurtz, Aleksandar Žiljak, Brandon Cracraft, Kevin G. Bufton, Paco, Crowerd Robinson, Ryan Neil Falcone, Tim Tobin, Matthew C. Funk, K. Trap Jones and Irvine Harker. 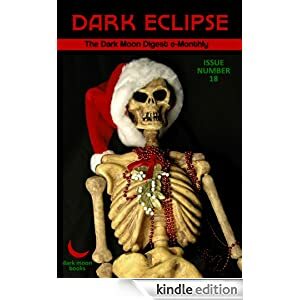 I'm pleased to report that my short story, I Walk, Therefore I Am, has been published in the December issue of Dark Eclipse Magazine. In honor of the Mayan calendar, Dark Eclipse Issue #18 focuses on apocalyptic, end of the world themes, which makes it a great fit for this tale. Dark Eclipse is available via Amazon.com for $1.99. Click here to purchase.